50 years ago, when the Soviet Union still existed, a political theorist, Hannah Arendt, suggested that the clearest sign that the Soviet Union could not be longer called totalitarian was the amazing recovery of the arts during that decade. The suggestion was very shocking: the Soviet Union would fall because of art; the suggestion was met with laughter by the experts, until it was proven true. While Yemen was never totalitarian by classical definition, it was yet not free, and the process of liberation that resulted from a peaceful uprising will require more than good will to succeed: Corruption and tyranny have left a country plagued by poverty and lack of education. In these circumstances, it is difficult to speak about cultural production in general, let alone art and films. Films play an important role in educating our taste and enriching our experiences: Before television and commercial photography, it was in the cinema that we learnt about love, fashion, politics, landscapes, etc. that happened elsewhere and that way we became acquainted with universal experiences. The status of film remained obscure until 1960’s when some theorists began to take it seriously as an art form, and it still remains a curious format, for as in words of Alan Badiou, “after all, cinema is nothing but takes and editing, there’s nothing else.” Its relevance however is indebted to its ability of being both artistic and entertaining. The country has been the foreground or background in a number of films. Since the 1920’s, with the arrival of expeditions from Europe, documentaries and travelogues were made in the country. European film archives contain works by Hans Helfritz from the 1930’s, Walter Dostal in the 1960’s, Gordian Troeller and Marie-Claude Deffarge in the 1970’s, Volker Panzer in the 1980’s, and Khadijah al-Salami in the 1990’s. Pier Paolo Pasolini filmed a segment of “The Decameron” (1970), as well as his “Arabian Nights” (1973) that contained sexually provocative imagery. He also filmed a little known short documentary, “The Walls of Sana’a”, about the architectural heritage of Old Sana’a. Hollywood has also drawn inspiration from Yemen and movies such as “The Queen of Sheba” (1921), Solomon and Sheba (1959) and Rules of Engagement (2000) have been at least partially set in Yemen. In 2003, two Lebanese filmmakers, Joana Hadjithomas and Khalil Joriege, filmed the travelogue of their adventure to recover a copy of their earlier film, “Around the Pink House” that disappeared after a screening in Yemen. 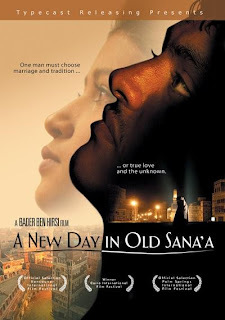 In 2005, the first and only Yemeni film to be shown at Cannes Film Festival, “A New Day in Old Sana’a” by Bader Ben Hirsi, a British filmmaker of Yemeni ancestry, received the best Arabic film award at Cairo International Film Festival. It is a romantic drama set in Sana’a, shown through the eyes of a photographer from Italy, in which a love story unfolds around a friend of the photographer having to choose between two women. It received positive criticism and one reviewer called it “a tale of magic realism”, similar to that evoked by the novels of Gabriel Garcia Marquez. This film was also shown in London in 2007, when SOAS organized the first Yemeni film festival. Even though it ran through three days, Ben Hirsi’s was the only Yemeni-made feature. The rest were short documentaries directed by European filmmakers such as Pascal Privet, Catherina Borelli and Tina Gharavi. Notable exception was a short film of Khadija al-Salami, “A Stranger in her Own City”, documenting the story of a young girl that refused to wear the veil. Since then, the only Yemeni contribution to film has been Ibi Ibrahim’s debut film “Sounds of Oud” (2012), a short film set in New York, but unmistakably against the background of Yemen; a colorful love story that faces the viewer with questions of religious tradition and family values against deeper edges, out of which emerge topics such as fidelity and homosexuality. Westwood’s appropriation of tradition is an interesting paradigm for a country in need to reinvent itself looking at the future with the questions of the present, without breaking off from what Pasolini, looking at Sana’a, called “grace of obscure centuries” and “scandalous revolutionary force of the past”. The relevance of art and of films in Yemen in a moment of transition is not only that of being entertaining or of documenting the rite de passage, or becoming tools of political persuasion. The art and films that will define the history of Yemen’s revolution will not be necessarily documentaries about the revolution – such as “Karama has no Walls” and a few short documentaries highlighting forms of social and political participations, but films that will confront us with the real question of the revolution: How can life be changed? In that sense, the steps of Ben Hirsi and Ibrahim to break taboos connected with love and sexuality, among others, are in itself, revolution on the make.